Kicked It In Heels announced their 5th Annual Kicked It In Heels Benefit- a night of great company, food and drink and amazing tunes benefitting the distinguished non-profit. 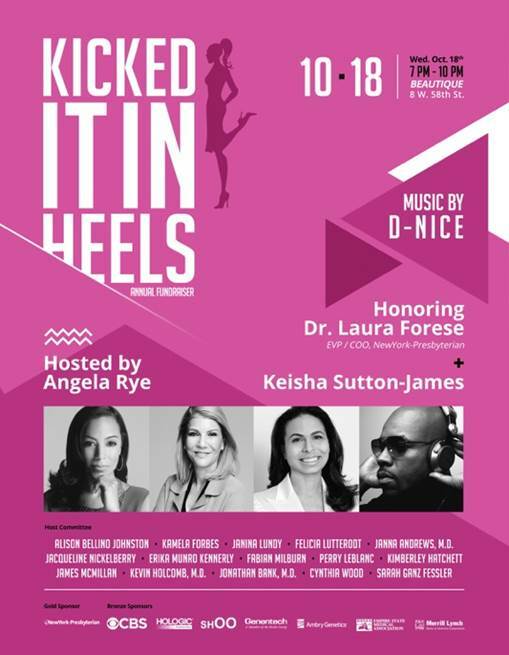 The event will take place Wednesday, October 18, 2017 at Beautique in New York City (located at 8 West 58th Street) and serves to garner support for the overall mission of Kicked It In Heels (KIH): to ensure that young women and women of color have the same access to care as their peers, and therefore the same success rates. This year’s event will honor two survivors: Executive Vice President and Chief Operating Officer of NewYork-Presbyterian Dr. Laura Forese, and Media Executive and Community Activist Keisha Sutton-James. CNN Commentator Angela Rye will be serving as host and the legendary DJ D-Nice will be spinning all night! The 2017 Kicked It In Heels Host Committee members include a diverse group of powerful NY professionals who are committed to creating awareness about breast cancer and how to survive it in style. The members are Alison Bellino Johnston, Kamela Forbes, Janina Lundy, Felicia Lutterodt, Janna Andrews, M.D., Jacqueline Nickelberry, Erika Munro Kennerly, Fabian Milburn, Perry Leblanc, Kimberley Hatchett, James McMillan, Kevin Holcomb, M.D., Jonathon Bank, M.D., Cynthia Wood and Sarah Ganz Fessler. Kicked It In Heels has held various campaigns and workshops throughout the years, which have raised awareness about issues facing survivors and celebrated their victories. They are making great strides but can always use more support. They hope that you will join! The event is sponsored by NewYork-Presbyterian (gold sponsor), CBS, Hologic, SHOO, Genentech, Ambry Genetics, Merrill Lynch and the Empire State Medical Association. While most organizations focus on raising breast cancer awareness, KIH focuses on celebrating survivorship while acknowledging issues relevant to young women and women of color. Issues around fertility, body image and sexuality can often become challenging for breast cancer survivors, which is where we step in.